Get your fingers greasy. 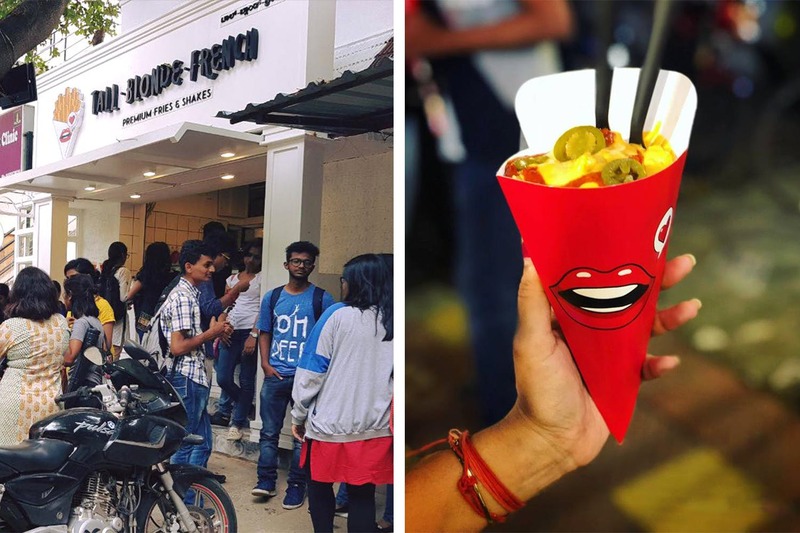 Bangalore’s Tall Blonde French (TBF) has opened in town. They are fryin’ and we are dyin’! Who can resist those tall gorgeous blondes dressed in so many different styles? To be precise, 31 different styles. Located on Wood Street, just beside the Kankaria Estates, TBF’s menu is loaded with 17 different veg and 14 non-veg fries from butter chicken to pizza flavoured and nachos and beans mix, slathered in cheese, topped with chilli, cheese, or chicken. Of course, we are yet to try all 31 but we loved their house special Three Bags Full and Bae Fries. The first one is a deadly mix of chilli, cheese and chicken shreds and the Bae fries is a chilli cheese mayo and jalapeno combo. But with all these flavours taking us to heaven, what we kinda missed was our favourite bacon. TBF’s menu is bacon-free. Next time, we definitely plan on trying their bestsellers Nemo and Hangover Fries. Their prices are seriously easy on the wallet (between INR 100 and INR 135). Well, what’s on offer is not just fries, but a whole lotta other sides. From Potato Cheese Pops to Chicken Nuggets and wraps of several types. In the end, wrap it all up on a sweet note with some delish cake shakes like Red Velvet or Choco Peanut Butter.